Skyfox from the Niftools team for his great tool NifUtils (a tutorial can be found here: http://skyrim.nexusmods.com/mods/21065). Bethesda for Skyrim and the Creation Kit. 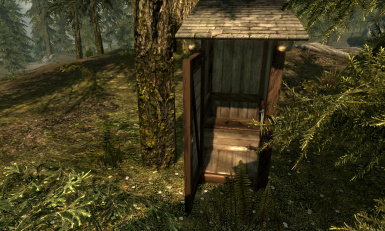 The outhouse will look slightly different from the Oblivion version as Oblivion's assets could not be re-used. Instead, the textures have been replaced with a mixture of custom and vanilla Skyrim textures. To make the toilet work in game, add it as a sitting furniture in the CK and choose the front sitting position, for instance edit the CommonChair01F. 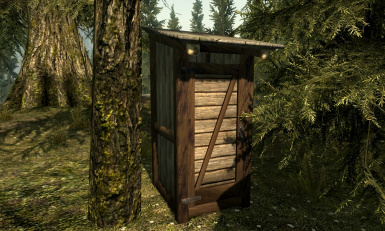 To make the toilet door work in game, add it as a door in the CK, for instance edit the FarmhouseAnimDoor01. You have to scale it down in the CK, a scale of 0.75 works fine.